Atlanta was HOTT. There was very little shade cover, little to no grass to sit on, and the burning pavement made for a hardly pleasurable walking experience. 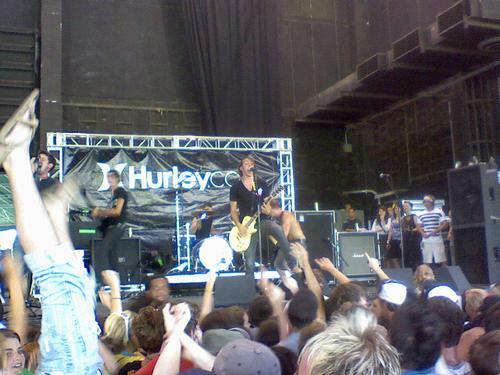 The first band I saw was Yellowcard, and I managed to catch the mid to end of their "set." They got the crowd screaming with their hit "Only One," then played a new track, "Fighting," and opened up one of the largest circle pits I have ever seen in my life. Chances are that it registered on a Richter scale somewhere. They ended with their classic "Ocean Avenue." I then managed to catch a special acoustic set with Funeral for a Friend. I've never been a huge FFAF fan, but wow, this acoustic set, albeit brief, was terrific. Matthew sounded great, and the songs just seemed to work very well stripped down. They played "History," "The Art of American Football," and "Into Oblivion." The crowd was singing along, clapping, and Matthew even got into the middle of it all for the last song. I then watched a band play for awhile, not knowing who they were, but I was very surprised by their musicianship and their sound. Turns out they are The Graduate, and they're a pretty good group of young guys. On their last song they had three people drumming at once, it was wild. Then it was off to see Straylight Run. The legendary John Nolan and crew never disappoint, and today was no exception. They opened with "Soon We'll Be Living In The Future," and quickly went into "Existentialism On Prom Night." There is just something really special about that song, and the audience went NUTS for it. I couldn't tell where the singing from John ended and the crowd's began, it was powerful. Michelle sang some of the songs she is featured on, and then the band closed with "Big Shot (Hands In The Sky)." It was a fitting song, as the clouds became ominous and some light rain began to tease us. After several minutes of clapping and shouting, the band was done. Flawless, as always. If you haven’t heard of Family Force 5, you’re missing out. These kids are from Atlanta, so this was like a hometown show for them. Their performance was completely out of control. There had to be at least ten people on stage at some points. It was one of the most energetic displays I’ve seen in a long time, with guys running around in neon pink 80s track suits, lots of people dancing on stage, everyone wearing masks and helmets, and a guy with hair bigger than the state of Texas. They were very entertaining, and I can only imagine what it would be like to see them in a real venue. I went to see The Almost, which is Aaron Gillespie, from Underoath’s new band. They put on a strong act, but the highlight was without a doubt their song “Amazing Because It Is,” which is basically a cover of the classic hymn Amazing Grace with some stuff added in. It sounded beautiful, and the crowd sang along, adding an almost choir like effect. It gave me chills. Then it was off to see a little band called New Found Glory. This was the biggest crowd so far. They came on and the place just exploded. This part is somewhat of a blur to me, as NFG is one of my favorite bands, and I was screaming and jumping with everyone else. They played mostly their classic songs, including “Understatement,” “Hit or Miss,” “Better Off Dead,” and ending with “My Friends Over You.” At one point a girl got hurt pretty bad and they had to stop the show. I’m not sure exactly what happened, but it was a big reminder that when you go to a festival, keep an eye out and be careful. All in all, these guys were amazing, and I highly recommend seeing them on their fall tour. Cute Is What We Aim For played while we were waiting for New Found Glory to come on, and I have to say they sounded terrible. That’s really the only way to put it. It was hard to believe they attracted as many people as they did. But hey, image is everything, right? The lead singer also wears his own merchandise, by the way, take that for what it’s worth. The day was winding down, or so I thought, as I went to see All Time Low. If you don’t know who these guys are, I would suggest you fix that this very instant. They’re a high energy pop-punk quartet out of Baltimore, and they put on a completely killer act. Pop-punk is a genre that has been beaten to death, but ATL is like a breath of fresh air. The melodies were great, and the sing alongs were even better. They played “Coffee Shop Soundtrack,” “Running From Lions,” “Break Out, Break Out!,” two new songs including “Dear Maria,” and the crowd went completely insane when they played “Jasey Rae.” But here’s the kicker, and quite possibly the coolest part of the entire day: Just when you think the set is over, and just when you think it couldn’t possibly get anymore insane, they went into a cover of Blink 182’s “Dammit.” The crowd went nuts, everyone was screaming, everyone was singing, bodies were going all over the place, and it just put an already awesome performance completely over the top. Look out for these guys, they just might be the next big thing. Coheed and Cambria played on the main stage to a huge crowd and put on their usual huge rock show. They played “Everything Evil,” “The Suffering,” “A Favor House Atlantic,” and a few others. I probably would have been more into it had I not been walking on pavement for nine hours already. The last band of the day that I saw was Mayday Parade. They put on a very, very good performance. They have a dual vocal style that works really well, and some of their songs are just so damn catchy. The crowd was surprisingly energetic, as I was unaware anyone really knew about this band except for me. They played one track called “Three Cheers For Five Years” which just completely blew me away. The lyrics, the singing, the crowd, everything was just awesome. They had a new album come out just last week, so they are another band I would recommend checking out. This brought my Warped Tour experience to an end. Aside from horrible temperatures, the woman at the gate not allowing me to bring my digital camera in, spending a lot of money on overpriced water, it was a pretty good time. 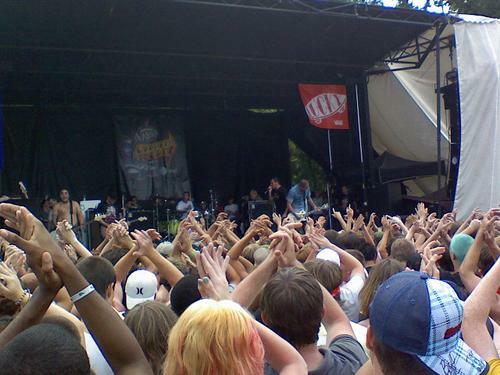 Warped Tour let’s you see tons of acts in the pop-punk emo rock world, from new to old, and you really can’t get this experience anywhere else. So I would say that if you don’t mind dealing with the heat, the crowds, the rowdy unsupervised children, and the exorbitant prices, then Warped Tour is a great event to attend. With so many bands in one place, you just can’t go wrong. I would have loved to see Coheed, that sounds absolutely amazing. I'll definitely have to look up All Time Low, though. Ending with Blink is a fantastic choice. I love the shot of the crowd clap session! And I've got to see Straylight Run live; it might be my goal for the year. Although, I'm honestly not into any of those bands. I like hearing about Warped Tour and this is a very vivid description of it. Needless to say, that clapping shot is pretty awesome. Damn Joe, your article almost makes me want to think about going to Warped Tour. Good blog. I'm pumped for warped this year. 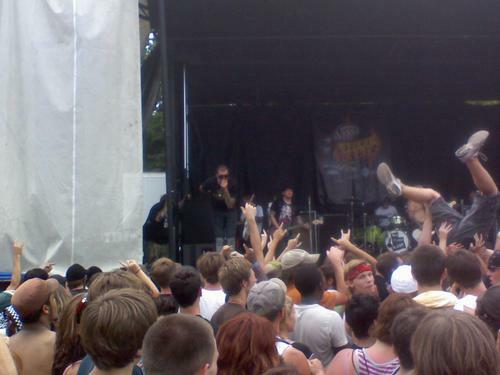 WArped tour 2007 was amazing. it was my first warped tour. can't wait to go next year.